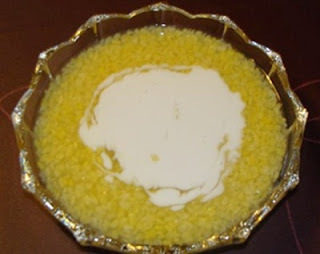 Tao Suan is the name of a Thai dessert that originally came from China. It is made of boiled soybeans that have the shell removed and are then stirred together with flour paste and sugar. Then you pour the coconut milk on top. It has sweet, salty and nutty taste mixed together. 1. Wash the split mung beans with water thoroughly. And leave them to soak in the water for about 2-3 hours. When the time is over the beans will bloom all over the bowl. Then put the beans in a sieve and let the water drain. 2. Wrap the drained and split mung beans with a thin white cloth (cheesecloth is good) and put it in the steamer. Steam until the beans are done (it usually takes about 20 minutes). 3. While waiting for the beans to be cooked, it’s time to make the coconut milk for topping. Start by mixing the concentrated coconut cream with salt and rice flour in a pot first. Then put the pot over the low heat. Stir back and forth for about 1-2 minutes until the flour is cooked (careful not to boil). Turn off the heat and set it aside. 4. When the beans are cooked then pour them into a bowl. Shake the bowl lightly to make sure the beans won’t stay in a lump. Set aside. 5. Add 2 cups of water into a pot and put the pot over medium heat. Then add sugar, stir until all the sugar is melted (if anyone likes it sweet, add more sugar as you like). 6. Mix the tapioca flour with a little bit of water. Stir until the flour dissolves and does not stick together (putting tapioca flour into hot water directly is strictly prohibited, it will make the flour stick and clump together). When the pot starts to boil, then pour the flour mixture into the pot gradually while quickly stirring at the same time. Stir until it gets shiny and thick and then add the steamed mung beans. Stir until the beans are spread evenly in the pot then turn off the heat. 7. Scoop Tao Suan into a bowl. Put a little bit of coconut milk on top. Serve immediately, either hot or cold. Tip: Do not skip the steps by adding the steamed mung beans into the pot before adding the tapioca flour. Because it will make the water get cloudy. The beans also will absorb all the water and make the beans bloom more. And when Tao Suan cools down could make the tapioca flour revert to the original form.